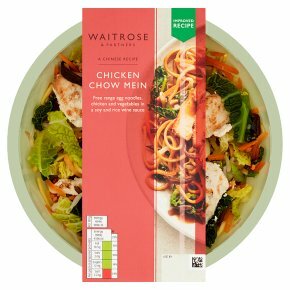 Succulent chicken breast with soft free range egg noodles and vegetables in an Oriental sauce. Free range egg noodles, chicken and vegetables in a soy and rice wine sauce. INGREDIENTS: Cooked free range egg noodles (water, fortified wheat flour (wheat flour, calcium carbonate, iron, niacin, thiamin), toasted sesame seed oil, rapeseed oil, pasteurised free range egg, salt, turmeric, paprika), sliced chicken breast (16%), savoy cabbage, black fungus mushrooms, carrot, bean sprouts, rice wine, onion, water, ginger purée, cornflour, garlic, rapeseed oil, sugar, fermented soya bean, salt, treacle, chicken extract, wheat, fermented rice, toasted sesame seed oil, rice vinegar, cane molasses, fortified wheat flour (wheat flour, calcium carbonate, iron, niacin, thiamin), wheat flour, onion concentrate, shallot, dried red chilli, rice bran oil, colour plain caramel, garlic powder, tapioca starch, red rice koji, spices, oyster extract (mollusc), rice flour, chilli powder, sunflower oil, rosemary extract.